Ahhhh, I can’t believe that I haven’t had a second to sit down today to write this post! Crazy day! It started at 6AM, with me brainstorming how to dress three kids like Native Americans for their school Thanksgiving Feast….and I was literally cranking all day with helping at school and bouncing from one job to the next like a ping pong ball. I was dizzy running from voice lessons to pick up times from play-dates and then home to whip up a quick dinner. So, I figure that with all the busy activity of the holiday season, I should share this yummy, quickie dinner that is pure comfort! Perfect after a long week. Key ingredient: pasillas. I am lucky enough to have a local farmer who sets out a gorgeous selection of fresh veggies with an honor-system cash dropbox. And yesterday, the pasillas were 6 for a $1!! So, they were obviously coming home with me 🙂 ….and yay, they helped me rock dinner! 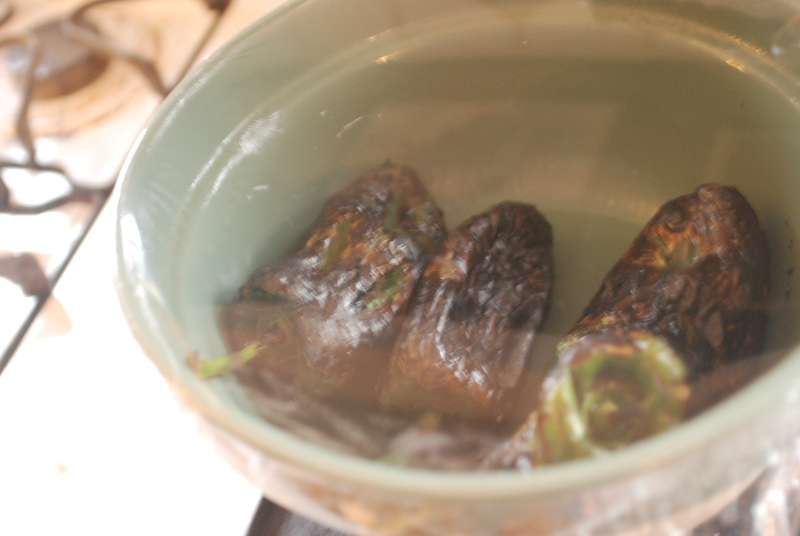 After they are blackened up nicely, you can throw them into a brown paper bag to make the skin easy to peel…but I live in a county that has officially nixed the paper bags, so, I opted for a bowl and Saran Wrap. 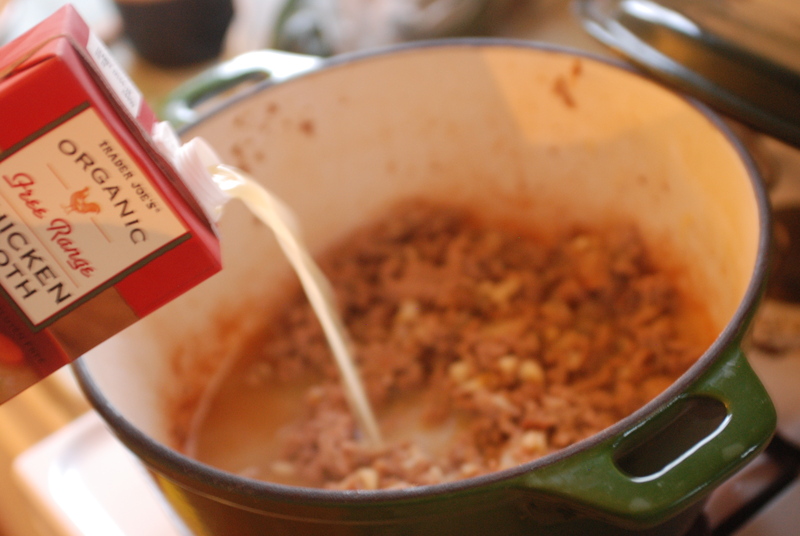 While these babies are getting ready, move onto the ground turkey….I just threw a frozen package into my dutch oven. 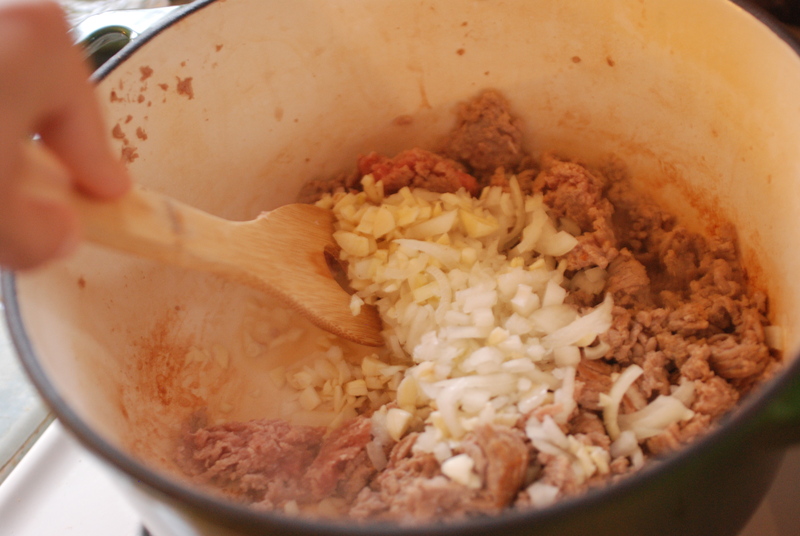 Combine with one onion and 7 cloves of garlic…once it is browned up and cooked, dowse it with a 1/4 cup of flour for thickening (if you need to keep things GF, mix some cornstarch with a bit of cold water and then add it to the meat and cook). 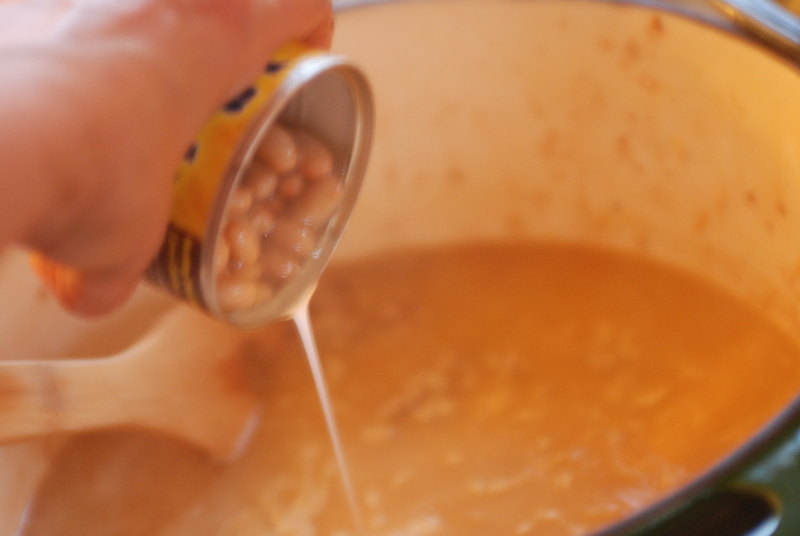 Now hit it with a carton of chicken broth and some cannellini beans out o’ the can (X2). And….back to those pasillas! Pull them out and their skins should just rub off. Remove their seeds and give 3 (or four 🙂 ) a rough chop and into the chili they go! 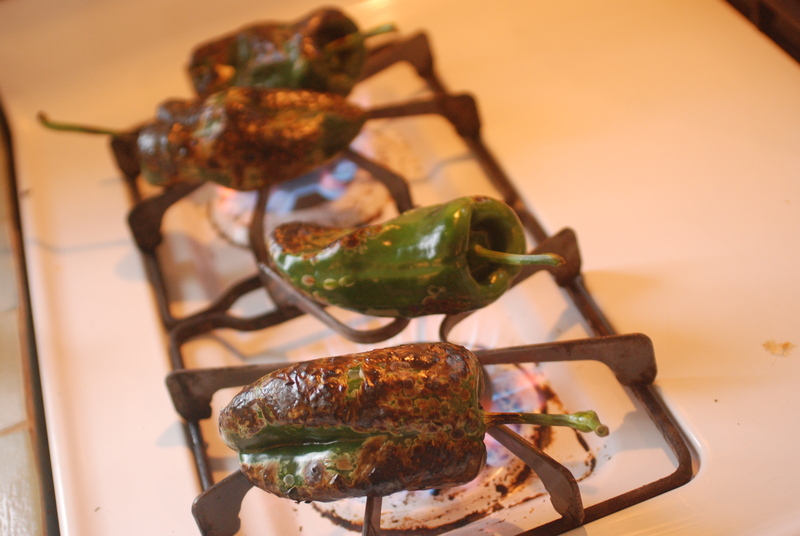 Season with some black pepper and a tablespoon of cumin….things are lookin’ good. I wish you could have seen my two toe-heads looking skeptically into the pot. My five year old was helping stir the pot while asking with a worried tone, “Is this gonna be spicy, mommy?? ?” Her brother kept poking his head over the pot and seconding that notion. 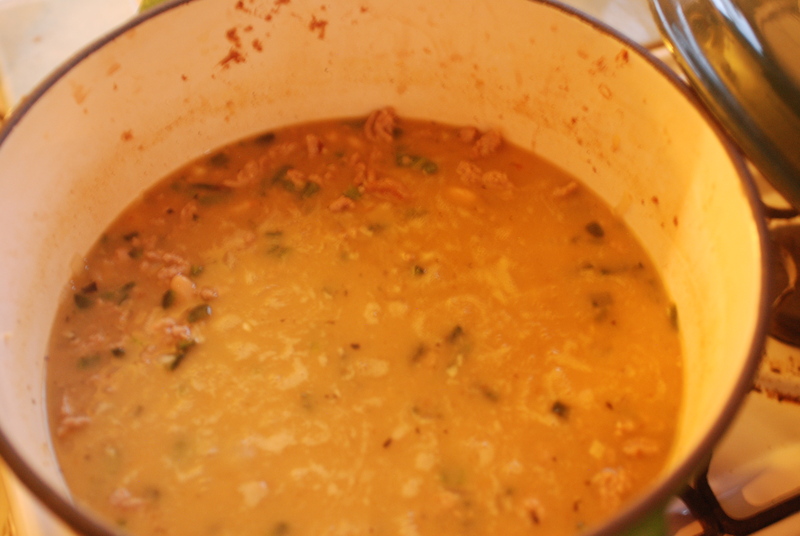 So, I immediately whipped out a spoon and let them be the grand taste-testers of dinner…….phew, they not only loved the first bite, but they devoured dinner, and my son went to school and told his teacher all about the awesome white chili that his mom “ZESTED“ up for dinner. LOL, hilarious….I think he is my biggest fan! Serve it up with some homemade cornbread if you have a couple of minutes to spare…or if not, go the speedster way (aka my way this week) by serving it with the all-reigning cheddar cheese quesadilla. YUM! Start by blackening the pasillas. Place them in a bowl and cover with plastic wrap. In a dutch oven, or large pot, brown the turkey, onions, and garlic. Once cooked, add the flour and cook until the dish appears pasty. 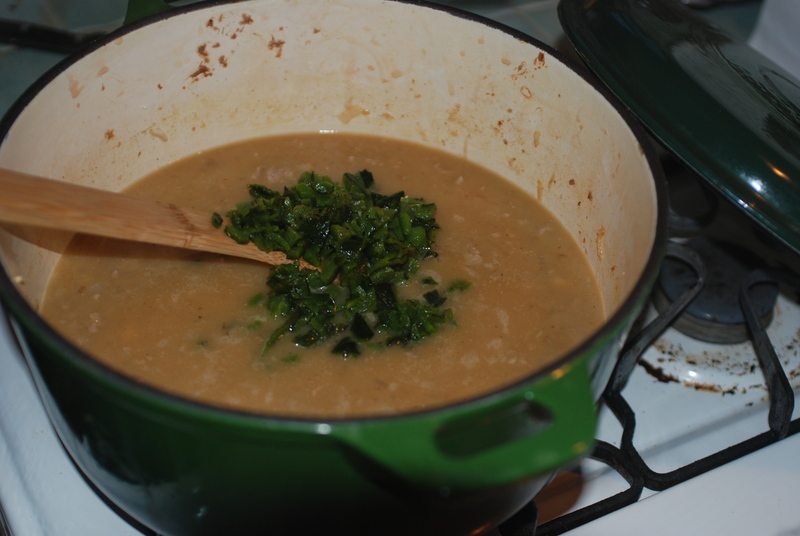 Now, add the entire carton of broth, the beans, cumin and pepper. 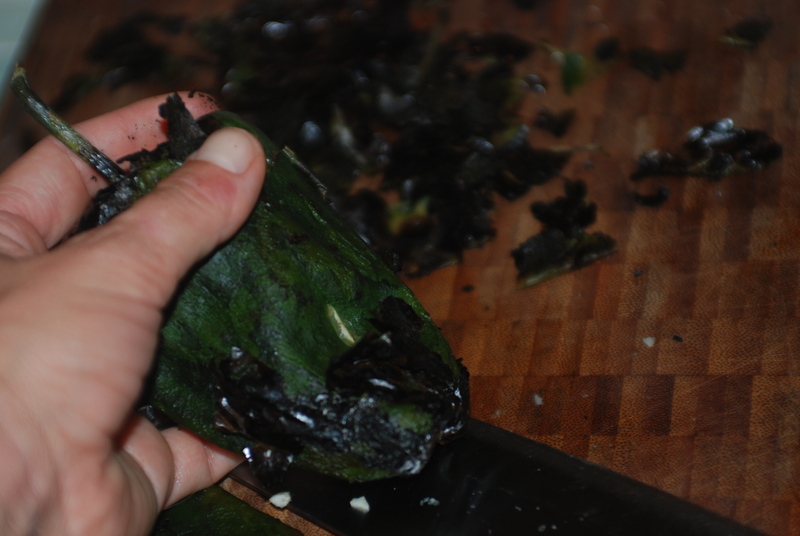 Now back to your pasillas…rub the skin off the chilis and remove the seeds. Now give them a rough chop and stir them into your chili. 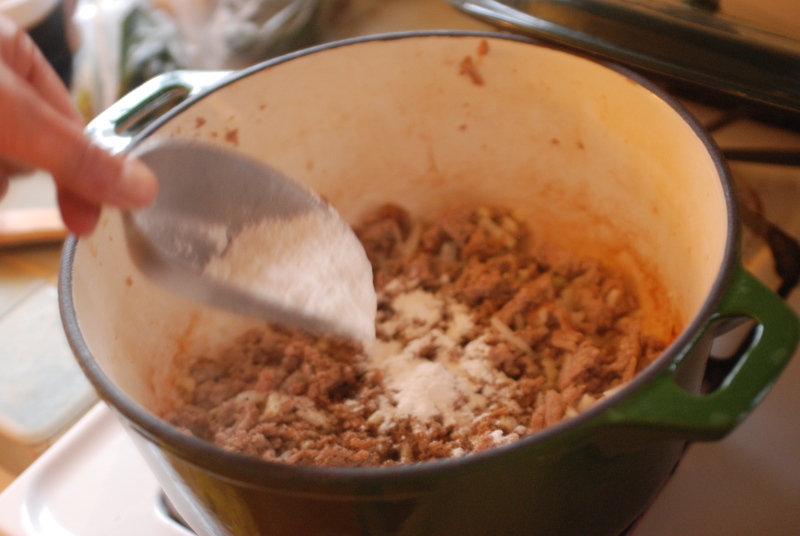 Check the salt level and let it simmer for 10 minutes, allowing it to thicken slightly. 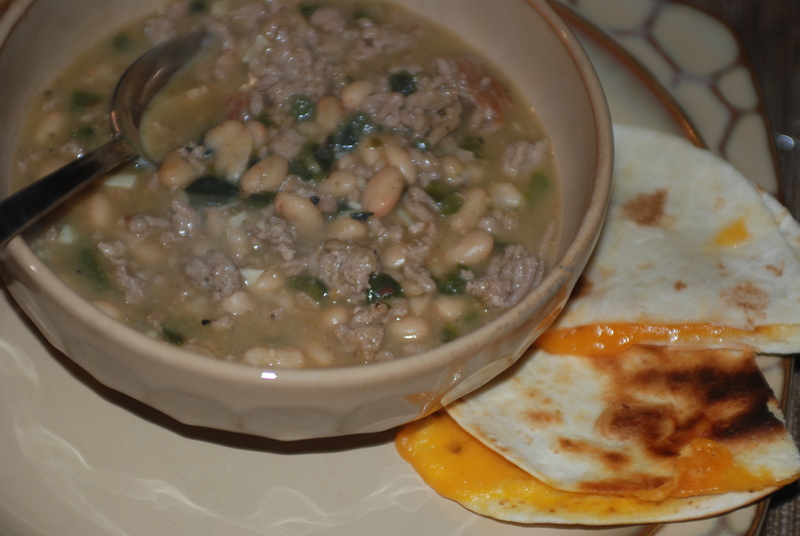 Serve with cornbread or quesadillas.